You can’t really tell from the picture, but this thing was as thick as two of my fingers and about four inches long. I was afraid to get too close because it had horns on its head! Having never seen anything remotely like it, I had to look it up. And I learned he (or maybe she) is an Imperial Moth Caterpillar. And if so, it’s going to be one BIG moth some day. 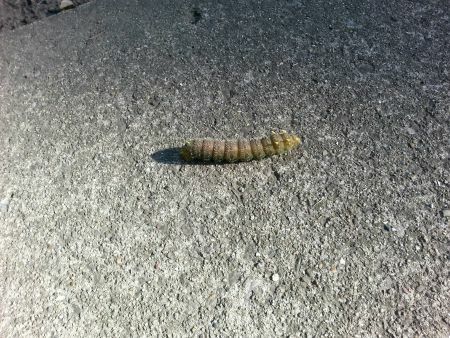 This entry was posted in Uncategorized and tagged big bug, big moth, Imperial Moth Caterpillar. Bookmark the permalink. I love it! Look at it! What a super thing. I quite like that it has horns. Interesting, aren’t they? Wonder why I’ve never seen one of these big fellas before though! I was thinking EXACTLY what you explained below the picture when I first saw it; that is; I’ll bet that thing is bigger than it looks. And ewwww – would that have been gross to have stepped on. For the critter and for you. He/she would have made a serious mess, wouldn’t he?! And, with sneakers being so grooved on the bottom, I’d have spent hours cleaning up my shoes! Bless you for living harmoniously….even if it IS creepy looking lol. Thanks, Morgan! Wish I could’ve photographed just how BIG it was! Wow. He is kinda of cute. I like the horns. And you have a royal caterpillar (I guess that it what it is called)! Way cool. Did you ever do the whole butterfly thing with Domer? I digress. I can’t wait to see pictures of him when he transforms into a BIG moth. Cute?? Well, yes, I guess. I think I’d have preferred his moth form over this worm-like version! I was going to guess tomato worm! Rats. Anyway, what a cute thing. You should take it home. Home?? Uh, no, that never entered my mind! He was just inching along, minding his own business, when I snapped his picture. The horns are a nice touch, don’t you think?! The horns are awesome! Imagine how many bugs died impaled on those lovely things!! I think I’d have preferred a butterfly, John, but a moth with fuzzy antennae is a good second-choice! I hope it was close to some grass or whatever. I would have picked it up and plunked it in a bush where it could find a place to make its cocoon. How neat that you got to see it! He was on the sidewalk, merrily inching along. Since I’d never seen something like it, I wasn’t about to scoop it up and move it, for fear I’d inadvertently hasten its demise! It’s cool thinking about it wrapped in a cocoon all winter and just waiting to emerge in a new form though! Ah, ha! Geography strikes again. When I saw it on the sidewalk, my assumption was that it was going to be baked or grilled, el pronto. We’re still so hot that the sidewalks are really hot — so much so that you can’t walk on them barefooted in the middle of the day. Once a snail or a caterpillar or whatever starts to cross, they sometimes cook before they reach the other side! In your situation, I can understand letting him (her?) just keep on trucking. Today won’t even reach 60 degrees, Linda, so he’s probably confused enough to think it’s time to hibernate, ha! Looks as fat as a snake! Yikes. He *was* big, Pat. Perhaps they have to bulk up in order to hibernate or something?? At any rate, no way anybody in their right mind would willingly stomp on him! Looked up pictures of the moth…have never seen one. It’s really pretty. I don’t think I’ve ever seen that species of moth either. I found his coloring to be pretty spectacular, very appropriate considering his name! I think I wouldn’t want to accidentally step on that!